Burrmos, huge predators of the Great Forest, are known man-eaters. Less known is the fact that not all their prey dies - sometimes, people who were believed to be long lost reappear, now servants of the beasts, devoted to their protection. Darous and Darem were stolen decades ago; legend has it that the burrmo king and his wife could not have children of their own, and the twins were his gift to her to dry her tears. They have made some gruesome appearances as the "princes of the burrmo", as they are now called. 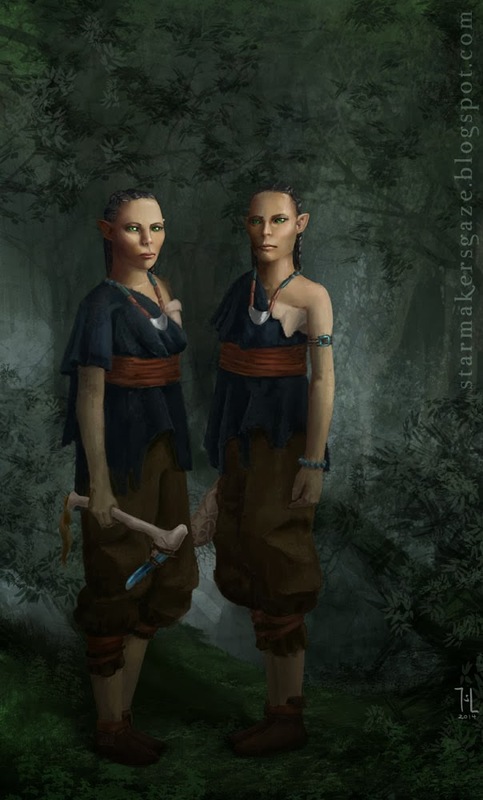 Elven twins are only one person in two bodies, and the edge this gives them over trespassers in their territory frightens off most who might try - the traveller meeting just one of them should be wary. "Do not enter our lands, traveller. The path will snap at your feet." The brothers live on the motto "an eye for an eye", and are less than friendly with the wild tribes of humans in the lower branches of the Great Forest. On occassion, however, Darous and Darem appear not as frightening guards of their pack's territory, but lonely wanderers caught between two worlds, longing for company. But their coldness always gets the better of them; they have never made any friends among the peoples of the Great Forest. It is a mystery how they were introduced into their pack, and whether or not they must be regarded as cursed. "And we will be the teeth. Turn back." I love elven twins. So scary. I also love the idea of animal princes, either of animal or human origin, since they add so much folklore mysticism to the world of Genius Loci. I usually invent things in groups, so there are several more animal kings to tell of.